(VEN) - The power distribution grids (110kV) in Hanoi cluster mainly in industrial parks and residential areas along traffic roads. Therefore, they can easily get dirty and are subject to electric discharge, short circuiting or loss of power without clean-ups in a timely manner. Previously, the only way to deal with dirtiness on power grids was to clean them up. Power was cut in certain sections for each clean-up and the staff had to climb up high tension poles and do the cleaning manually. Each clean-up spell often took several days and needed a large number of staff. In addition, power cut-offs risked instability of the system and lack of power resources for additional charge, especially led to interrupted power supplies to customers, reduction of the commercial power output and reduction in revenue. Meanwhile, the cleaning staff was always under high pressure of work and the job risked unsafe practices for laborers. To resolve this problem, the Electricity of Vietnam (EVN) is implementing a pilot insulated clean-up solution or hotline insulated clean-up. This was a scientific research project of Power Transmission Company No. 3 by Deputy Director Nguyen Van Xuan and engineer Nguyen Tri Dung. 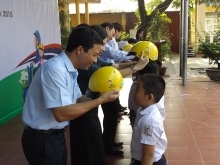 The project won the second prize of the 2012 Vietnam Fund for Supporting Technological Creations Award (VIFOTEC). EVN Hanoi has recently piloted a hotline clean-up at the 110kV Van Dien transformer station and obtained very positive results. In the third quarter of 2014, EVN Hanoi will assign the Hanoi High Tension Grid Company to prepare the purchase of equipment to carry out the hotline clean-up job. This insulated clean-up solution uses a high pressure water jet cleaner to spout directly up to the poles, transformer stations and other equipment of the grid to remove dirt. Now the solution has been checked by the Labor Safety Department under the Ministry of Labor, Invalids and Social Affairs and showed very good results. The biggest differences between the two clean-up methods were cost and time to do it. The hotline clean-up is suitable with the current management and operation methods and financial capability. Not only saving time and costs, the most important thing is to ensure stable power supplies and no more power cut-offs. Especially, the time for clean-ups is shorter and this new method is also cleaner, safer and needs fewer staff. The hotline clean-up does not only resolves electric discharge but also brings many benefits like reducing unsafe risks, operation costs and minimizes power-cuts. This is an important norm for EVN Hanoi to improve its service quality. For example, when cleaning 62 poles, 13 transformer stations of customers and 28 transformer stations of power companies with total capacity of 10,897kA, if the job is done manually it will need about 11 hours of power cuts, equal to 41,000kWh and about VND23 million of wages for the cleaning staff. However, if applying the hotline clean-up method, it will only take four working hours with total cost of VND5.7 million (equal to 24.6 percent of the manual clean-up)./.